Headline inflation came in at 3.1% year on year in November, dropping 0.7 percentage points compared to the almost six-year high seen last month. The details show there is no surprising driver behind the nosedive except the expected drop in price change in fuel. On a monthly basis, fuel became cheaper by 4.7%, while the annual rate of inflation slowed down from 16.2% to 7.2% in November. The latter means the drop in fuel prices dragged down the headline reading by 0.68ppt, so practically it means that the deceleration happened only because of the change in oil and fuel prices. Orange signs point to an acceleration while grey signs signify a slowdown in inflation compared to the previous month. Orange in grey border means the level is unchanged. Other than that, food inflation slowed down by only 0.1ppt, remaining well above the average CPI. Tobacco prices are up by 6.2% on the year, showing a deceleration from October, and having a downward effect on the core inflation reading. Core inflation – at first glance – remained flat at 2.6% YoY, but it shows a 0.046ppt acceleration, so the upward trend has been on since August 2018. However, we see some signs of underlying inflationary pressure building up. Inflation in services accelerated to 2.2% YoY in November - a pace not seen since early 2015. 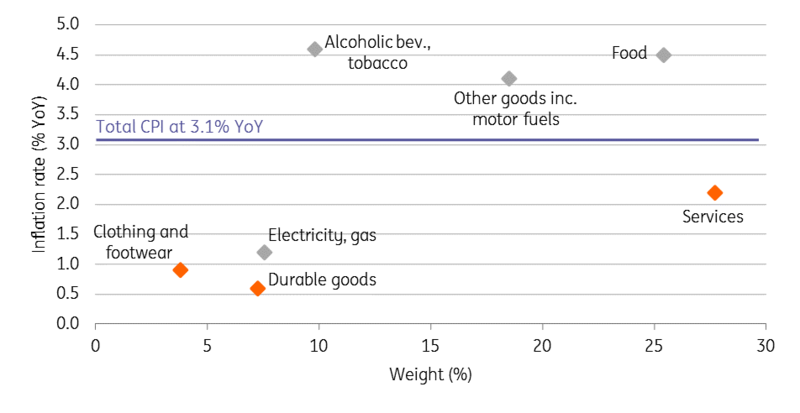 Prices went up in consumer durable goods by 0.6% on the year, the highest reading in this product category since mid-2016. 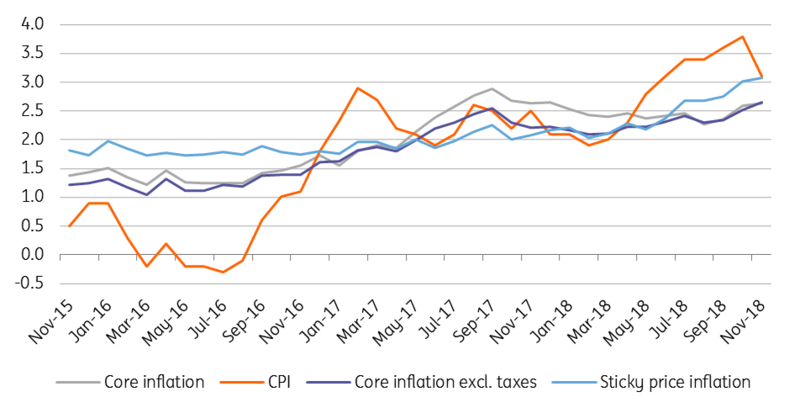 The central bank of Hungary calculated core CPI excluding indirect taxes are up to 2.7% YoY, while the sticky price inflation has been at and above the target for two months. Undoubtedly, the data is likely to be interpreted by the National Bank of Hungary as a clear justification that they need to maintain loose monetary policy and there is nothing to fear from a price pressure point of view. 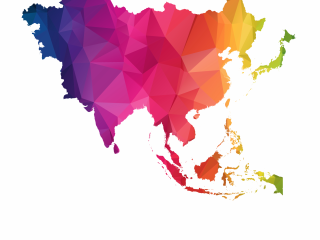 However, we believe that the build-up of inflationary pressure is increasing behind the scenes and it will push the central bank to change its monetary stance in 2019. According to our forecast, average annual inflation is expected to be around 3% in 2018 and at 3.4% in 2019.